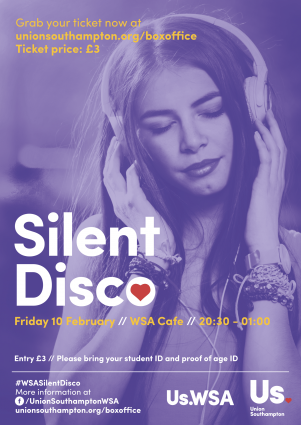 We’re delighted to announce that we will be holding a Silent Disco at the WSA Cafe on Friday 10 February. Join us from 20:30 for a chance to don your headphones and dance like no one’s watching. You will be able to collect tickets from the WSA Cafe or from the Union Box Office in Highfield using your Student ID and proof of purchase. Don’t forget to bring your Student ID and proof of age ID on the night to get entry.